My future's so bright...I gotta wear shades!!! Hey everybody, it's Truffles! 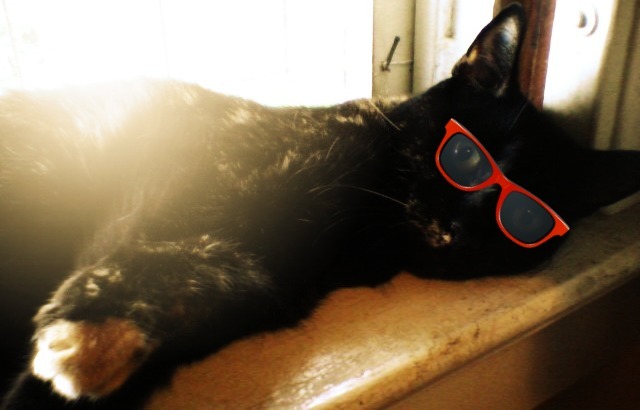 Today is National Sunglasses Day, so for our Caturday Art Mommy took this picture of me lounging in the window and applied the Sunglow effect in PicMonkey, then added my cute red sunglasses from their Overlays options. She's going to use it to hold her sunglasses. The sun has been out so little lately that they never leave her purse, so this gives them a fun place to live! My momma wear sunglasses constantly! You look lovely in your shades, Truffles. How adorable you look, Truffles! You look so cool! My mum wears sunglasses most of the time as she is sensitive to light. Aww, you are looking adorable Truffles! 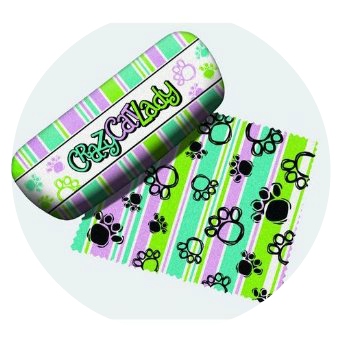 Cute...Truffles and the glasses case! So cool! Mom says now she has a worm in her ear (eeeewwwww), but she said it's a good one! How cute your art is! Looking cool in those shades! Aaaaaw Yous lookin' cute Truffles. Weez had no idea it was sunglass day. And what a cute gift. You look super cute in sunglasses , Truffles ! What a fun art pic of you!